The sudden death of a 40-year old anaesthetist at the Beijing Fuwai hospital this month has put the spotlight on the high work burden of anaesthetists in China and the shortage of doctors in this speciality. Colleagues of the doctor who died of a brain haemorrhage after a long shift are not only mourning him but also the dire state of their branch of medicine. Many of the deceased doctor's colleagues said it could have been them, given the amount of strain they are working under. As one doctor told the CCTV news station, anaesthetists were working such long hours that some of them took naps on spare operating tables. And it was well known that there have been more than 15 fatigue- and stress-related sudden deaths among anaesthetists in recent years. 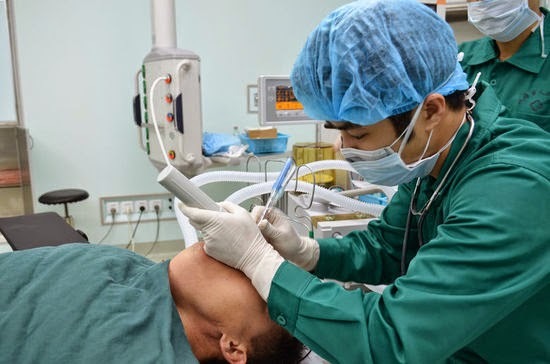 A recent survey carried out by the Chinese Medical Association's anaesthesia branch found that more than half of the doctors were working shifts in excess of 10 hours a day and 80% believed they were working beyond safe limits to do their job properly. In addition, 70% of anaesthetists said they were dissatisfied with their branch of medicine. These findings were confirmed in an interview with an anaesthetist in her mid 40s who told reporters that it was not unusual to do 12 hours shifts due to the lack of staff and it was even known for doctors to work right through a double shift of 24 hours. The president of the CMA anaesthetist branch Professor Hou Ren said the job was highly stressful as they literally had people's lives in their hands every hour of the day. The job was especially taxing because of the high workload and lack of time for preparation, which meant that an anaesthetist might be dealing with a frail elderly person one minute, then a person with cardiovascular problems the next and later a pregnant woman . Each of these situations required very different management and skills, he said and anaesthetist had to make decision and adjustments according to a patient's condition by the minute. He said the main problem was that the anaesthetist workforce had not kept track with the increasing number of hospital patients and operations. There were 2.8 million doctors in China, of whom only 2.5% were anaesthetists, which meant there was a national shortage of about 70,000 anaesthetists. And while some hospitals had enough anaesthetists in theory, in practice there were always shortages because anaesthetists were off sick, on study leave or because they had to teach students. To remedy the problem some general physicians were being re-trained as temporary anaesthetists, but this was only a short term solution, he said. Another way of addressing the problem was to learn from foreign countries which had managed to use anaesthetists more efficiently through the use of technology and better staff management, he added. In the meantime, anaesthetists faced high levels of pressure and there would continue to be overwork, stress and potentially unsafe work situations.